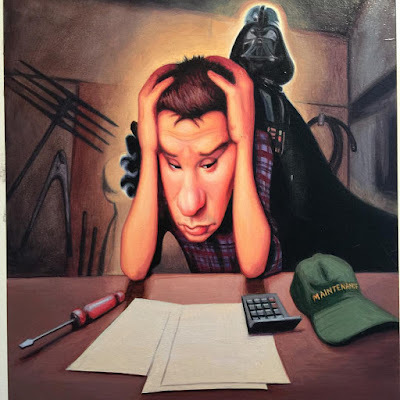 Recently Golfdom Magazine called upon artist James Bennett to take on the cover portraying the hardships that come with being a golf course superintendent, and those who leave it to "go to the dark side". Then there are the guys who became superintendents and quit, to take a job in sales. Fertilizer sales, equipment sales, irrigation equipment, etc. — they’re still in the golf maintenance business, but they have “gone to the Dark Side.” This is a universal term in the industry, and it happens frequently." James beautifully illustrates a clearly overwhelmed and frustrated superintendent who is perhaps doubting whether he should leave or stay; what would you do? The image will be featured on the cover of the July/August issue so keep your eyes peeled! Eric Drooker // "The Fight Begins"
Introducing Rob Rey to RSAR!